On a recent Saturday at the Heart Street homeless shelter in Kingston, Sharon Mary "Chiz" Chisholm becomes excited as she and her volunteers unpack fresh onions, eggplant, peppers, and zucchini, and began preparing ratatouille. "We used to make all our meals with canned goods," she says. "We don't do that anymore." For 10 years, Chisholm says, she made three meals a day with almost no vegetables. Then she heard about the Hunger Project. The Hudson Valley is an exceptionally bountiful region, with over 500 farms on more than 18,000 acres. Yet the region is also considered highly food-insecure, meaning in some areas there are more people going hungry than the national average. Food pantries and soup kitchens have traditionally been limited in what they can offer people. In addition, many people live in "food deserts," which are communities, often low-income, with limited access to supermarkets. The result is a wide divide in the quantity and quality of food, based on income. Over the last several years, hundreds of people across the region have collaborated through programs like the Hunger Project to get local food to people who need it most. 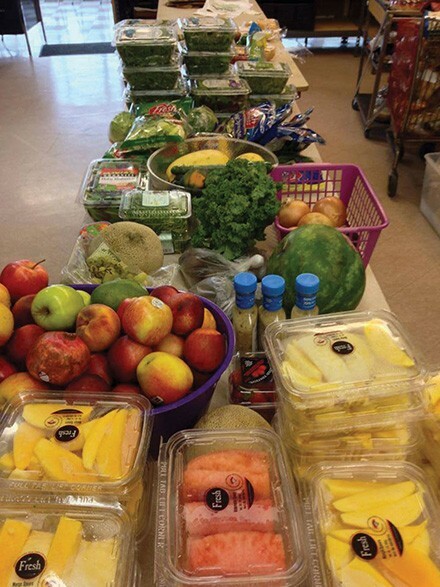 The produce table in People's Place Food Pantry is always full of surprises, from donations of food from grocery stores to organic greens from local farmers. Farmers have traditionally had strong connections to their communities, but donating excess crops requires lots of time and resources. Beth McClindon, the program director of volunteer services at Family of Woodstock and the director of Ulster Corps, says the movement to bridge the gap gained momentum at a 2009 conference called Hunger in the Hudson Valley where representatives from several agencies, including Ulster Corps, Family of Woodstock, and the Rondout Valley Growers Association, discovered they had a common concern: to reclaim food that would otherwise go to waste. Their collaboration turned into a coalition of workers and volunteers from farms and community gardens, gleaners (or harvesters), food processors, storage facilities, food pantries, and soup kitchens. Despite this herculean effort, the region's food insecurity has continued to grow. 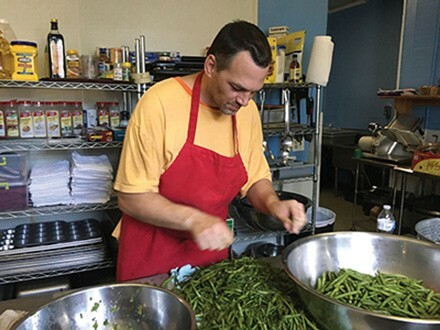 As federal and state-funding for Supplemental Nutrition Assistance Program (SNAP, formerly known as food stamps) and similar resources have decreased, residents have expanded their efforts to alleviate the hunger experienced by so many of their neighbors. In 2014, the Local Economies Project awarded a three-year grant to the Community Foundations of the Hudson Valley. With the help of the grant and an anonymous donor, Foundations established the Hudson Valley Farm Fresh Initiative, which has funded major components of this effort and brought them together to focus on long-term goals. 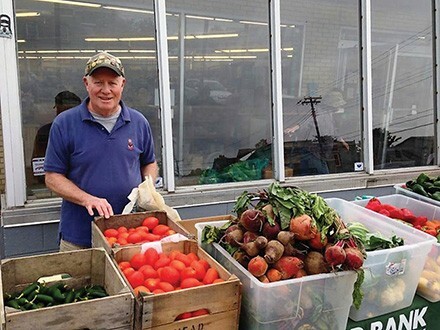 In Ulster County, the Rondout Valley Growers Association collects donated food from farms, then sorts, weighs, divides, and distributes it to pantries, soup kitchens, shelters, and other emergency programs. Executive director Deborah DeWan, says much of the produce they glean isn't accepted at markets because "it might look a little different, but it's still great food." Some of that food goes to the Food Bank Farm Stand program, a partnership between the Community Foundations and the Food Bank of the Hudson Valley that was initiated in 2014. Free farm stands were established in three locations: In the parking lot of People's Place in Kingston; at Kingston's Ulster County Community Action Center; and at the Newburgh Armory Unity Center, which is operated by Cornerstone Family Healthcare. John, a volunteer at People's Place, works the front of the line for the Farm Stand every Tuesday. People's Place executive director, Christine Hein, says they used to be almost exclusively stocked with canned goods, and any produce that came in was donated because it was unmarketable. Freshly harvested fruits and vegetables are now free every Tuesday morning and feed an average of 300 families each week. Mobile markets are another successful aspect of the grant initiative. The Poughkeepsie Plenty Mobile Market parks in convenient locations within the city of Poughkeepsie between June and October and tries to fill the food gap in a city where 32,000 people share two supermarkets. Most recently, People's Place has led the enterprise of five cold-storage food hubs in Ulster County that safely store and distribute food on its way to pantries. DeWan says it also makes distribution easier. "Instead of us driving to 50 food pantries, we e-mail the pantries what we have and they pick it up," she explains. "This keeps the food fresh and reduces waste." Volunteers also use the hubs to store and process food for use during winter months. For example, when they recently received a deluge of tomatoes, volunteers made tomato sauce. Reverend Darlene Kelley, Executive Director of Caring Hands Soup Kitchen in Kingston, said the farm hub is key to their improved operations. "In the past, it was hit or miss. This way, the quality is consistently better." One of the major turning points in the Hudson Valley craft beverage surge took place in 2015, when husband and wife Dennis Nesel and Jeanette Spaeth opened Hudson Valley Malt, paving the way for truly local grain-to-glass production. Lucky Dragon, which had its grand opening last night, Thursday, April 11, is a celebration of classic Chinese restaurant fare and of the Hudson Valley’s bounty. Like Cinnamon before it, this “farm-to-chopsticks” restaurant in Rhinebeck broadens the scope of farm-to-table into ethnic cuisine.